Turning in the wrong direction. Saying something that’s not right or should not be said. The big question that makes a significant difference in my life is – how often do I stumble? Is making a bad choice a rare thing in my life? Or does it happen pretty regularly? Do I learn from my mistakes so I don’t do it again? Or do I keep doing the same thing over and over? There’s a big difference between an occasional stumble and being a regular ‘stumbler’. And that difference will be pretty obvious in the amount of negative consequences we have to deal with in our lives. Putting ourselves on the throne of our lives. 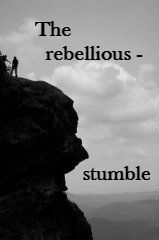 Rebellion is a mindset that will cause us to stumble – regularly. So, in reality, I choose how much I’m going to stumble when I choose my level of obedience to God. Please help us obey so we can avoid being a regular ‘stumbler’, Abba Father.